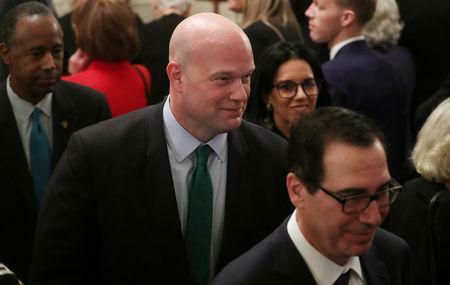 WASHINGTON (Reuters) - The fight over President Donald Trump's appointment of Matthew Whitaker as acting attorney general has reached the U.S. Supreme Court, with lawyers in a pending gun rights case asking the justices on Friday to decide if the action was lawful. Critics have said the Republican president's appointment of Whitaker, who now will oversee Special Counsel Robert Mueller's investigation into Russia's role in the 2016 U.S. election, on Nov. 7 to replace the ousted Jeff Sessions as the chief U.S. law enforcement official violated the Constitution and federal law. Lawyers for Barry Michaels, who filed a lawsuit in Nevada challenging a U.S. law that bars him from buying a firearm due to prior non-violent criminal convictions, decided to make Whitaker's appointment an issue in their pending appeal before the high court because Sessions was named as a defendant in the case. "There is a significant national interest in avoiding the prospect that every district and immigration judge in the nation could, in relatively short order, be presented with the controversy over which person to substitute as Acting Attorney General," the lawyers, led by prominent Supreme Court advocate Thomas Goldstein, wrote in a court filing. Michaels' lawyers argued that Rosenstein, the department's No. 2 official, should have succeeded Sessions under a federal law that vests full authority in the deputy attorney general should the office of attorney general become vacant. Some of the same lawyers behind Friday's motion also are involved in a similar effort brought before a federal judge on Tuesday. In that case, Maryland Attorney General Brian Frosh asked a federal judge to bar Whitaker from appearing in an official capacity as acting attorney general in the state's ongoing lawsuit against the Trump administration over the Affordable Care Act healthcare law. Maryland also argued that Trump violated the so-called Appointments Clause of the Constitution because the job of attorney general is a "principal officer" who must be appointed by the president and confirmed by the Senate. 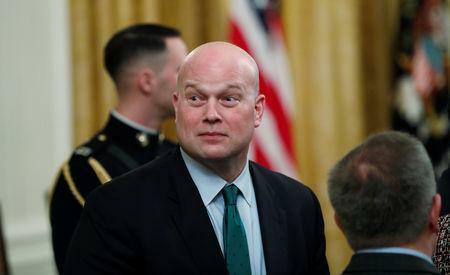 The Justice Department on Wednesday defended the legality of Whitaker's appointment, saying Trump was empowered to give him the job under a 1998 law called the Federal Vacancies Reform Act even though he was not a Senate-confirmed official. Congressional Democrats have voiced concern that Whitaker, who they have called a Trump "political lackey," could undermine or even fire Mueller. Mueller's investigation has led to criminal charges against a series of former Trump aides and has cast a cloud over Trump's presidency.